Headache treatments can mean the difference between intense, pounding head pain that prevents you from living life to the fullest and headache relief, allowing you to function normally. Many people who suffer from headaches rely on their medications to prevent and treat headaches but a medication is not going to be effective if it does not reach its target in the body. The mode of delivery can also influence how likely it is that a person will take the medication as directed, especially when medication dosing is quite frequent. New delivery methods are important to improving ease of use for medication schedules and also to improve the actual delivery itself of the drug to the targeted parts of the body. To understand the need for new delivery methods, however, it is important to look at the problems associated with more traditional modes of delivery. Oral medications work well for some migraine and headache sufferers, but a moderate number struggle because the nausea and vomiting that occur from a migraine can make swallowing a medication extremely difficult. Migraine sufferers also have stomach problems that accompany the migraine, which affects the absorption and efficacy of the drug. This means that relief can be significantly delayed or reduced. Non-oral styles of delivery include nasal sprays but many people do not tolerate the side effects and find them inconvenient to administer. It is thought that the best type of delivery for a migraine would not need to be administered orally but would still offer excellent and fast relief. Nasal sprays and injections work well for some patients but one of the problems with nasal sprays is that patients report a bitter taste as a side effect. They may also experience irritation and stomach discomfort because a nasal spray does not completely avoid the gastrointestinal tract. An injection does provide rapid relief and it avoids the stomach discomfort associated with other methods of delivery but patients do have extremely high blood levels of the drug, which can then cause side effects. 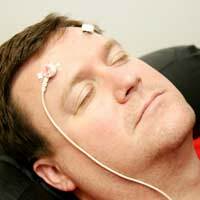 Iontophoretic drug delivery is a newer form of headache medication delivery. It involves the application of a low-intensity electric current to a person's skin, thereby providing drug delivery through the skin. Two electrodes are used, one of which is saturated in a solution that has the drug and the other is placed in a salt solution. When a low current is transmitted across the electrodes, the drug is carried through the skin to the person's blood. Triptans are a common treatment for head pain and these can now be administered through iontophoretic drug delivery. The patient has a device that controls the drug delivery and they can initiate the treatment. A major benefit to the treatment is that those individuals who suffer from nausea and other gastrointestinal complaints from their migraines can avoid the discomfort of oral medications. It can also outperform modes of delivery such as injections or nasal sprays, which tend to have side effects. In addition, iontophoretic patches used for some of the triptans have the added bonus of not exposing a person to a high blood level of the drug - as injections do - which further reduces the potential for side effects. The main downside to this type of delivery, however, is local irritation such as itching. Headaches and migraines continue to plague many people and can wreck havoc on a person's functioning and daily life. The quest to find successful treatments is an important one but researchers must also investigate modes of delivery to ensure that the drug reaches its target and does so with minimal side effects and discomfort to the patient. Newer methods such as iontophoretic drug delivery have numerous benefits and will hopefully be refined even further to provide the best headache and migraine relief possible.